This time the UCI is making sure that saddles are "horizontal." LES ESSARTS, France (VN) ─ Well, the UCI has done it once again. On Saturday commissaires controlling bikes before Sunday’s team time trial decided to check whether or not saddles were level (UCI rule 1.3.012 states that “the saddle support shall be horizontal”). This caught out almost every one of the 22 teams at this year’s Tour de France. In fact, more than half of Saxo Bank-Sungard’s riders had to change their saddle positions minutes before the start. Team boss Bjarne Riis was livid. Quite frankly, he was right. Officials gave no warning that they would be enforcing the largely ignored rule. And it’s ignored with good reason. There is no consistent way to measure the hundreds of different saddles that pros use. It’s especially difficult to tell whether a saddle is level if it has a cutout or valley in the tail. Team Radioshack’s Johan Bruyneel echoed Riis, directing his comments to the UCI WorldTour manager, Philippe Chevallier. But even though Chevallier wasn’t in the mood to talk, team managers from several of the world’s biggest teams insisted on stepping behind the bike-check tent and airing their grievances in private to Chevallier and the other UCI commissaires in attendance. 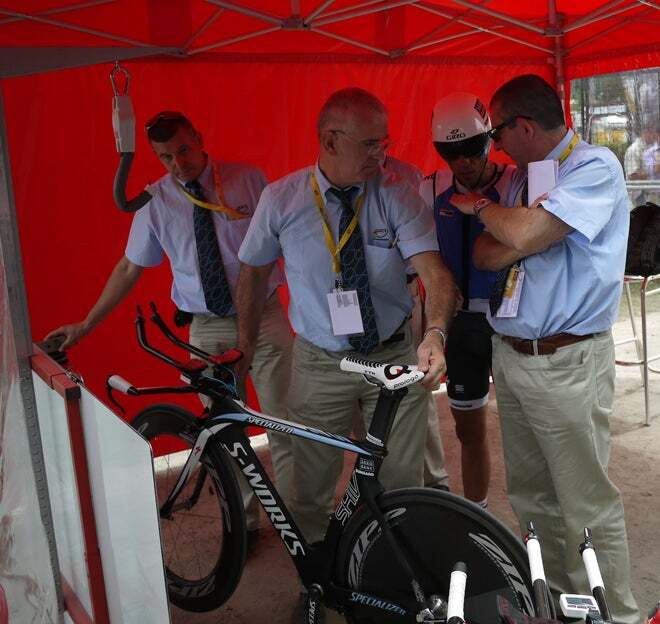 The test jig that the commissaires had was actually one of the best I’ve seen, but it still had its shortcomings. While it did effectively measure saddle setback and aero-bar extensions, when commissaires put a level on top of riders’ saddles the officials assumed that the measuring jig was sitting level. Several savvy mechanics brought their own levels and pointed out that the jig was not. Carsten Jeppesen, Team Sky head of operations, pointed out that while the jig wasn’t level it actually helped the teams get away with slightly nose-down saddles and he didn’t bring that to the attention of the commissaires (or other teams). All this leads me to ask: Does the UCI flip through its rulebook, searching for poorly written rules, and decide to enforce them randomly at events? It does seem to be a case of bullying, asserting authority simply because it can. I think that everyone involved in the sport on the technical side agrees that we need regulations. But we need them to be clearly written and universally enforced. Last-minute escapades like Sunday’s make everyone look bad, from mechanics and directors who lose their cool and UCI commissaires who stand back and sulk after their rulings are questioned. This is not the way forward for cycling.